Set aside some time for you. Indulge in a little pampering in our spa-like setting. Our warm and caring team of massage and skin care professionals, invites you to experience our tranquil spa and feel for yourself the benefits of a harmonious body, mind and spirit. Massage and facial gift certificates, are available upon request. Come in today and see how relaxing better health, flexibility, and beautiful skin, can be! Cranio Sacral Therapy is a gentle, hands-on method of evaluating and enhancing the functioning of a physiological body system called the craniosacral system – made up of the membranes and cerebrospinal fluid that surround and protect the brain and the spinal cord. Using a soft touch, your therapist releases restrictions in the craniosacral system to improve the functioning of the central nervous system. This complement to the bodies natural healing processes, is increasingly used to bolster resistance to disease and is effective with a wide range of medical problems. Discover how Cranio Sacral Therapy can help you or your child. A gentle, hands-on session of therapeutic body work during which the fascia (connective tissue) is manipulated and stretched to relieve restrictions and tension. This therapy is an art form and the therapist performing Myofascial Release can actually feel the body respond to the treatment and can ease any restrictions that they feel. This gentle technique has helped many people overcome long term chronic pain problems, even after they’ve been told they have to “live with it”, or that there’s nothing that can be done for them. Make an appointment today to eliminate your pain and restore fluid motion! Deep penetrating heat from smooth, warmed stones heal and revitalize the body. This soothing, relaxing form of massage helps the tight muscles release and improves circulation and joint mobility. Imaging relaxing in this warm environment, while oiled stones glide with strokes of acupressure massage, over your entire body. Come and enjoy this nurturing touch today! As a mother-to-be you undergo dramatic physical and emotional changes, a therapeutic touch is just what you need to adapt to your new image. Massage therapy helps in many ways…improves circulation, which helps decrease edema, leg cramps and varicose veins. Massage can aid in the reduction of excess fluids, guiding fluid into circulation where it can be easily eliminated, and relieves the mental and physical fatigue associated with pregnancy. Regular massage therapy, during pregnancy and postpartum weeks, can help you cope with the demands of your new life and provide a bit of peace and tranquility. Prenatal pillows are used to allow for stomach lying for ultimate comfort. Come and enjoy a deep muscle tissue massage to increase lymphatic flow and circulation. With regular massage, athletes can prevent injuries which might otherwise be caused by overuse. The subtle scent of invigorating essential oils will leave you uplifted and energized. Melt away your soreness before, or after a sporting event, today! This full body massage is a firm, but gentle approach to improve circulation, ease muscle aches and tension, improve flexibility and create relaxation. The long gliding stokes toward the heart enhances oxygen flow in blood and helps rid the body of toxins. The Swedish Massage promises to promote relaxation, a sense of well being and healing. Rodan + Fields® is changing skin and changing lives by partnering with independent business owners across the United States to bring innovations in anti-aging skincare to everyone. Founded by world-renowned dermatologists Dr. Katie Rodan and Dr. Kathy Fields, the creators of Proactiv® Solution, Rodan + Fields’ AMP MD™ System* makes real results possible at home without injections or other invasive procedures. Named the #1 Premium Anti-Aging skincare brand in North America and the Fastest-Growing Beauty and Personal Care Brand in the U.S. (by Euromonitor – the world’s most comprehensive market research on the skincare industry). Decide today how you are going to look tomorrow. Does the never-ending pursuit of the “latest and greatest” wrinkle-fighting creams and “innovative” ingredients leave you with nothing but jars of hope filled with empty promises? Try a steady diet of intelligent skincare. The REDEFINE Regimen is a comprehensive skincare system that layers powerful cosmetic ingredients and proven peptide technology to visibly firm skin and reduce the appearance of lines, wrinkles and enlarged pores. The REDEFINE Regimen features four full-size products: Daily Cleansing Mask 125 mL/4.2 Fl.Oz. ; Pore Minimizing Toner 125 mL/4.2 Fl.Oz. ; Triple Defense Treatment SPF 30 30 mL/1.0 Fl.Oz. ; and Overnight Restorative Cream 30 mL/1.0 Fl.Oz. It’s not what you see … It’s what you don’t see. Exposure to the sun and the environment can leave you with less-than-youthful skin. Erase the signs of premature aging, including brown spots, dullness, and sun damage with REVERSE. REVERSE Regimen exfoliates, lightens, brightens and protects your skin for a more even tone and texture. Recognized on Allure Magazine’s A List, the REVERSE Regimen features 4 full-size products: Deep Exfoliating Wash 125 mL/4.2 Fl.Oz. ; Skin Lightening Toner 125 mL/4.2 Fl.Oz. ; Skin Lightening Treatment 50 mL/1.7 Fl.Oz. ; and REVERSE Broad Spectrum SPF 50+ Sunscreen 50 mL/1.7 Fl.Oz. Where do you turn when your face can’t take it anymore? Calm the flush-blush reaction of a hyper-sensitive complexion with SOOTHE. Clinically proven to reduce redness and irritation in as little as 5 minutes, SOOTHE shields against the biological and environmental aggressors that can trigger inflammation, helps fortify skin’s natural moisture barrier, calms visible redness, and reduces irritation so that you can take comfort in having a healthy-looking complexion every day. 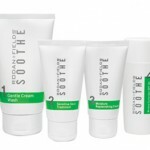 The SOOTHE Regimen features 4 full-size products: Gentle Cream Wash 125 mL/4.2 Fl.Oz. ; Sensitive Skin Treatment 50 mL/1.7 Fl.Oz. ; Moisture Replenishing Cream 50 mL/1.7 Fl.Oz. ; and Mineral Sunscreen SPF 30 50 mL/1.7 Fl.Oz.